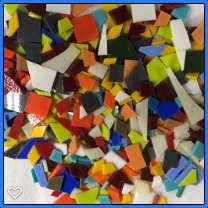 1 Square foot COE 96 Scrap Stained Glass in a variety of colors, Shapes and Sizes. 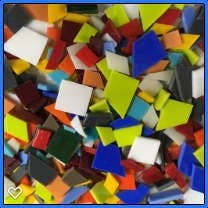 One square foot of glass weighs approximately 1.5 pounds. 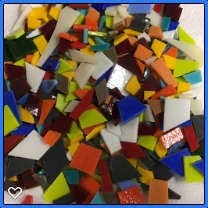 I hate to call this scrap because it is so beautiful and useful. 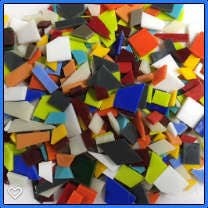 This glass is generated when we either square a sheet of glass, or, if the glass doesn't break to a specified size when we're cutting tiles. All of this glass is added to a barrel daily. 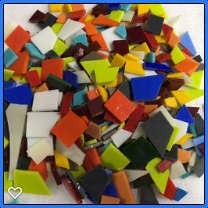 This scrap comes from sheets of Uroborus or Spectrum and both have a COE of 96 which is compatible with any other COE 96.